That’s right, I visited that primary school from 1961 till 1965. Most of the teachers were nuns living accross the road. I can remember the headmaster she was called Sister Emelda and when you had to go to her that wasn’t very nice. Usually you got the ruler on the back of your hands with the thin side or if she said “turn around and bend forward” it was the long stick on your behind. 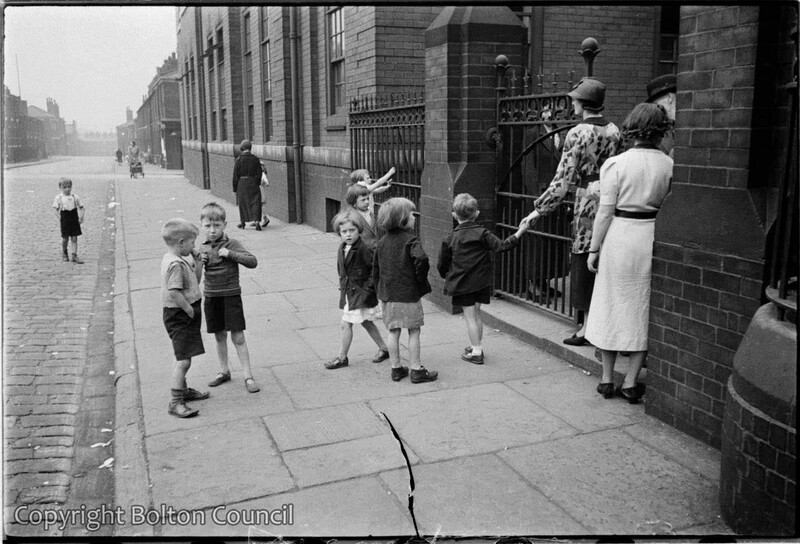 Next to the school was/is the St Peter and Pauls catholic church and accross the Pilkinton Street was the canteen for dinner. I drove every day there and back from Hulton Lane bus station with the bus 80, 81 or 82. along St. Helens Road. Around half an hour. My mum went to this school (Doreen Jones) and used to tell similar tales of Sister Emelda shouting out at children saying “I am the bride of Christ!” We were all so sad to hear that the church has been demolished. Oh that’s sad to hear that the church has been demolished. I got baptised, had the first confession and got my first comunion there. I can remember beeing in front of the church a few years ago and it was shut up and in a pretty sorry situation. When was it demolished and what is standing there now? I know it was very sad and effected my mum as for so much a part of her life. I now live in Lancaster so don’t get to Bolton much and I think it would be too upsetting to go and look. I think it was demolished about 2 or 3 years ago? My mum and uncle would have been there in the 40’s. Doreen and Roland Jones. Don’t know if they were of your era? no I’m a later era I was born 1956 and went to St Peter & Pauls from ’61 till about ’65. I also moved away the end of the sixties but my journey took me to the South of Germany (Nuremberg). I was last time in Bolton 2012 and I can remember the church was boarded up then, probably waiting for the demolishing truck. My mother in law went to this school her name was Mary honoria swift she still lives in Bolton and is 86. My Mum’s name was Mary Doreen Jones. She would have been around your mums age so maybe they knew each other. Unfortunately my mum has now passed. I attended classes during my infant and junior years, I had my first holy communion 19th April 1970, in my class there were many wonderful children, there is a special boy I will always remember, Gerard Boyle, I would love to hear from him again. My name then was Linda Misko, there were many good teachers my favourite teacher was Mrs Clarke. Did you used to live in farnworth? And was your father called Josef? I have received a letter at your old address regarding missing relatives from Finland and ex Soviet Union which may be of interest to you. If this is you could you please email me at argo0311@gmail.com.